*This offer is only available to qualifying retail customers who are the named and intended recipient of this communication. Offer consists of a choice between: (i) preferred financing/leasing rates, or: (ii) an Owner Loyalty Rebate of up to $1,000 off the purchase or lease of select new 2017/2018/2019 Mazda models, until April 1st, 2019. Under no circumstances can lease/finance rates be reduced below 0% APR. A $500//$1,000 Owner Loyalty Rebate is available to qualifying retail customers who cash purchase/finance/lease a select new, in-stock 2017/2018/2019 Mazda3 Sedan, Mazda3 Sport, Mazda6, or CX-5//MX-5, MX-5RF or CX-9 model from an authorized Mazda dealer in Canada between April 2nd, 2018 - April 1st 2019. Rebate amount varies by model. Rebate will be deducted from the negotiated price after taxes, has no cash surrender value and can be combined with lease/finance rates or any other offer. Conditions apply. Offer is subject to change or cancellation without notice. Contact your participating Mazda dealer for details. Mazda Canada Inc. reserves the right to modify or discontinue any part of this program at any time. 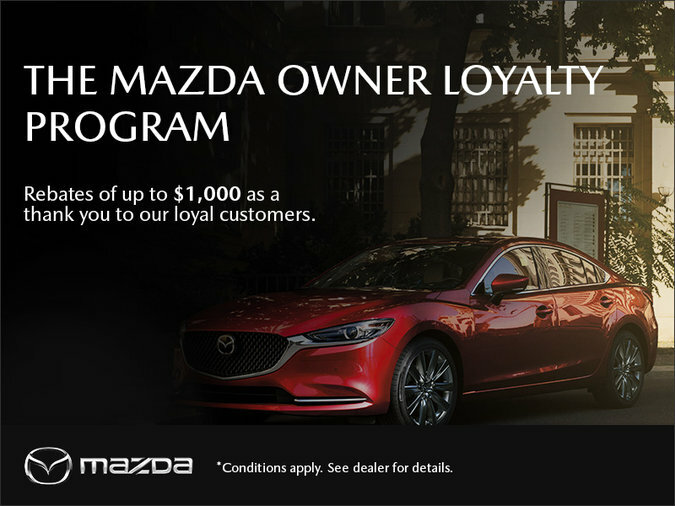 The Owner Loyalty Program* rewards current Mazda customers who are either purchasing an additional new or Certified Pre-Owned Mazda or trading in their current Mazda.